Common reading tools are built in right into Word: page through a document, add comments, define and translate words, and copy or highlight text, as well as other convenient reading tools. You can turn full screen mode on or off in the ribbon. If you’re reading a document, not writing or major editing, click or tap View > Read Mode to hide the writing tools and menus and to leave more room for the pages themselves. Read Mode automatically fits the page layout to your device, using columns and larger font sizes, both of which you can adjust. To get out of Read Mode, click or tap View > Edit Document. In addition to the reading controls you use regularly, you can zoom in and out on images and other objects, expand or collapse sections, or watch embedded videos. Adjust columns, page color, and layout. 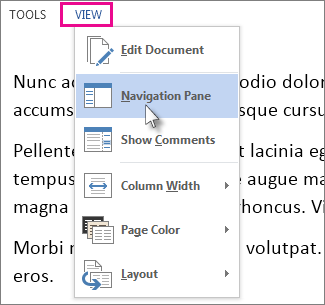 Open the Navigation Pane to quickly move around in the document. Click View > Read Mode to switch to the Read Mode layout. Click or tap the arrows on the edges of the screen to turn the page. 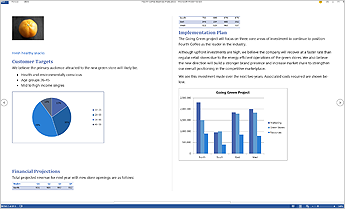 Double-click or double-tap to zoom in and make tables, charts, and images in your document fill the screen. Click or tap away from the object to zoom back out and continue reading. If there are comments in the document, you’ll see a comment hint in the margin. Click it to read that comment. To see all of the comments, click View > Show Comments. To add your own comments, select the content you want to comment about and right-click it, then click New Comment, and type in the comment balloon that appears. Tip: Other options on the View list open the Navigation Pane, change the column width or background color, and switch from columns to a conventional layout. Select and right-click the text you want to copy, and click Copy. In Word 2016, click Translate or Smart Lookup. In Word 2013, click Translate or Define. To learn about dictionaries in Word 2013, see Where’s the dictionary? Select and right-click the text, click Highlight, and click the color you want. Reopen a document and keep reading right where you left off. Word remembers where you were, even when you reopen an online document from a different computer. Full Screen Reading view is optimized for reading a document on the computer screen. In Full Screen Reading view, you also have the option of seeing the document as it would appear on a printed page. On the View tab, in the Document Views group, click Full Screen Reading. Click View Options, and then click Show Two Pages to view two pages, or screens, at a time. Press CTRL+RIGHT ARROW or CTRL+LEFT ARROW to move one screen at a time. First, make sure that the Show Printed Page option under View Options is not selected. 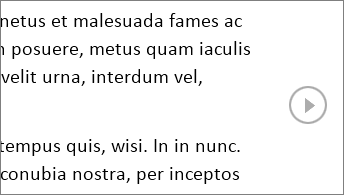 To display the text in a larger size, click Increase Text Size. To display more text on the screen, click Decrease Text Size. To display the page as it would appear when you print it, click Show Printed Page. To display two pages at the same time, click Show Two Pages . To jump to the first or last screen of the document, press HOME or END. To jump to a specific screen, type the screen number, and then press ENTER. You can use the Browse the pages in your document tab in the Navigation Pane to find the section of the document that you want to jump to. If the Navigation Pane is not visible, click Page x of x at the top center of the screen, click Jump to a page, and then click Navigation Pane. To jump to any heading in the document, click the Browse the headings in your document tab, and click any heading. This option is unavailable if your document has no headings defined. To jump to a particular page, click the Browse the pages in your document tab, and then click the thumbnail image for that page. On the title bar, click the arrow next to Text Highlight Color. Click the highlight color you want to use. To turn off highlighting, click Text Highlight Color, and then click Stop Highlighting, or press ESC. To change the highlighter color, click the arrow next to Text Highlight Color, and then click the color that you want. On the title bar, click Insert Comment. To allow typing in the document, click View Options, and then click Allow Typing. Click View Options again, point to Track Changes, and then click Track Changes. Click Tools, and then click Find. In the Find what box, type the text that you want to search for, just as you would in any other view in Microsoft Word. If you want to replace the text that you find in the document with some other text, click the Replace tab, and then, in the Replace with box, type the replacement text. Note: To use Replace, you must click View Options, and then click Allow Typing. Select a word or phrase in the document. Click Tools, and then click Research. Note: To select a particular type of research material — such as a dictionary, translation dictionary, encyclopedia, or thesaurus — choose a research service in the Research task pane. Click Close in the upper-right corner of the screen, or press ESC. To display the text in a larger size, click Increase Text Size. To display more text on the screen, click Decrease Text Size. To display the page as it would appear when printed, click Show Printed Page. To display two pages at once, click Show Two Pages . You can use the Document Map or the Thumbnails pane to find the section of the document that you want to jump to. If the Document Map or the Thumbnails pane are not visible, click Jump to a page or section in a document at the top center of the screen, and then click Document Map or Thumbnails. To jump to any heading in the document, click that heading in the Document Map. To jump to a particular page, click the thumbnail image for that page. In Full Screen Reading view, you can highlight content, track your changes, add comments, and review changes. Click Reading Tools, and then click Text Highlight Color. To turn off highlighting, click Reading Tools, click Text Highlight Color, and then click Stop Highlighting, or press ESC. To change the highlighter color, click Reading Tools, click the arrow next to Text Highlight Color, and then click the color that you want. Place the insertion point where you want to add the comment, click Reading Tools, and then click New Comment. Click Reading Tools, and then click Find. In the Find what box, type the text that you want to search for, just as you would in any other view in Microsoft Office Word. Click Reading Tools, and then click Research.